I left Albert Lea later than I hoped, but the drive to Clear Lake, Iowa, was quick. As I drove along, I thought about the events of the early morning hours of February 3, 1959. My eyes welled-up often as I thought of that awful crash in a corn field that took the life of Buddy Holly (one of my heroes), J.P. Richardson (The Big Bopper), Ritchie Valens and Roger Peterson (the pilot). I could not help but think of the many ironies connected with my visit to Clear Lake. First, as a former on-air deejay at Oldies 97 (WCZX-FM, Poughkeepsie, NY) and producer/intern/deejay for “Super 70’s Saturday Night” on WDAQ-FM (Danbury, CT), I have a certain expertise when it comes to the music of the 50’s, 60’s and 70’s. I also was a student in “The History of Rock and Roll” at SUNY Oneonta in 1978 … the first time such a course was offered in New York State. Without sounding too old, I have a very vivid recollection of Rock and Roll from 1963 forward; I’ve read and studied music from 1954 to 1980 and the roots of rock. IMHO, Buddy has always been the single greatest influence on rock, not only through his music but also as an inspiration to other major artists (The Beatles, for example). Another connection between Buddy Holly and me goes to Don McLean, the singer/songwriter of “American Pie” … a tribute to Buddy Holly. McLean and I attended the same high school (Iona Prep, a few years apart), so many of the references in the song make perfect sense to me. I hope to set up a Buddy Holly page next week with an interpretation of the lyrics to “American Pie” and some great photos for you to download. Another irony is that I did not plan this visit and may have missed it. At the last moment on Thursday, I made the decision to head south on I-35 from Minnesota to Des Moines. While driving, I heard “Words of Love” by Buddy and I looked up Clear Lake on the map. It was too uncanny that Clear Lake was directly on my route. One last irony is that Iowa represents an ending for both Buddy and me. Buddy lost his life in Iowa, and my trek to visit all 48 of the contiguous states in the U.S. was completed here. Of all the places visited in the last eleven days, this was the most special to me. 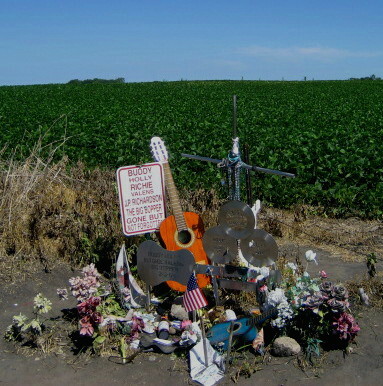 In a corn field about 5 miles north of town, a devoted fan purchased the land where the plane crashed and erected a small shrine. The most striking observation is the feeling of peace, quiet and isolation. The spirits of these talented performers are long gone from here and are a part of every musician who carries the rock and roll torch. Having previously seen the original pictures of the crash, it was easy to understand how cold and desolate that fateful morning must have felt. As if to add drama to the moment, a single-prop plane passed directly overhead as I stood in silence to pay my respects to the memory of Holly, Valens and Richardson. Entering the gorgeous town of Clear Lake, I found the Surf Ballroom, the last place where Buddy and his fellow spirits performed on the evening of February 2. The club has been restored to its original appearance and it contains some wonderful memorabilia. I was happy just to stand on the stage where Buddy last performed. One can only wonder what would have been had the heat on the tour bus been working, or if the plane had reached its destination safely. The remainder of the day took me through Iowa and Illinois and into Indiana to a small town named Granger, just east of South Bend (home to a somewhat competent college football team). I’m back on the Eastern Daylight Time with about 735 miles to home. The traffic in eastern Iowa and Illinois was disgusting, and people there are awful drivers. They cut in front of other cars like they are squeezing in with a shoe horn. Women drive aggressively at 95 MPH with their kids in the car; the men are even worse. Tomorrow is a short drining day, maybe just 600 miles or so, enough to put me a few hours from home and an arrival early Sunday afternoon.